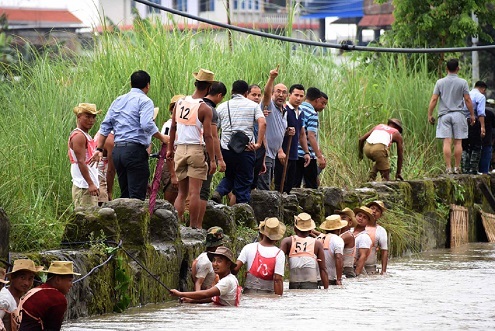 Manipur Chief Minister N Biren Singh along with Water Resources Minister Letpao Haokip personally supervised repair of the breached embankment of river Imphal at New Checkon in Imphal East District on Wednesday. Water Resources Minister Letpao and Commissioner H Deleep went down into neck-deep flood waters and joined the repair work of the breached area at New Checkon. Chief Secretary Dr Suresh Babu, DGP LM Khaute, Imphal East DC Th Chitra, Imphal East SP K Meghachandra and other high-ranking civil and police officers were also present when the Chief Minister visited the area. Works Minister Th. Biswajit and Agriculture Minister V. Hangkhanlian, MLAs N Indrajit, Dr Sapam Ranjan and L Susindro also briefly visited the area where the Chief Minister supervised repair works till night. Speaking to reporters, CM N Biren said that all possible efforts are being put in by the Government for the early repairing of all the breached river embankments at different places of valley districts. Informing that State and Central forces personnel including newly recruited State police personnel have been pressed into service to assist the locals in this regard since early morning, he expressed hope that they would accomplish the work by late evening. Regarding the landslide along NH-37 (Imphal-Jiribam road) due to heavy downpour in the past three days, he said that he had talked to National Highway and Infrastructure Development Corporation Limited officials and asked them to construct road diversions to restore normal traffic at the earliest. Appealing to the people to bear with the inconvenience, he informed that relief camps had been opened at around 15 places so far besides sending rescue personnel and relief materials to affected areas. Water Resource Minister Haokip said that the current flood is mainly caused by excessive rainfall at catchment areas in the hills. It is more like overflowing of river water than breaching of embankments this time, he added.